Finding the best drain snake can be a challenge. You may get confused or overwhelmed by the many products on the market. You may lack adequate information or experience to distinguish good products from the not-so-good. It’s also possible that you don’t have time to review each and every product, or you fear to make a wrong decision. In this expert reviews, we will look at the best drain snakes on the market. To come up with the list, we focused on the main aspects which include the length, size, cleaning ease, user-friendliness, reliability, durability, and price. Without much ado, let’s begin the comparison. Accordingly, do away with any lingering fear and have a look below. Do You Want the Hand Driven or Power Cranked Option? What Head Type Do You Want? 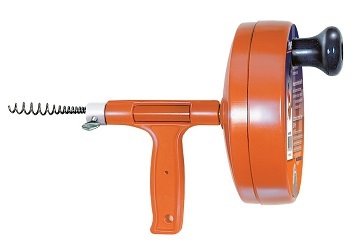 First on this review is the 59787 K-3 Toilet Auger from the RIDGID brand. It comes with a practical length and flexibility for use in many situations. The slender, flexible cable easily goes through most pipes and plumbing and requires minimal effort to do so, while the sizeable bulb head clears away any debris with the turn of the crank handle. According to our expert’s opinion, the sturdy compression-wrapped cable can withstand the stresses, kinks, and regular use. The best toilet auger snake can go through bends and curves and pull it out is not very hard. The vinyl guard is aimed at protecting the porcelain from scratches and other effects. However, that isn’t very appropriate for the heavy-duty operation. It also doesn’t go very deep due to its relatively short length. Next, we have the Cooper GTV drain snake that also has been on the market for a considerable period. The device should fit in most piping and also get rid of any debris whether food, fur, hair, or grease that may be causing a blockage. The cleaner is made of stainless steel and PP material and is tolerant to corrosion and rust. It has an ergonomic handle for better handling. The non-slip grip lets you turn the handle conveniently even with wet hands or in a wet environment. The 6-pack unit comprises various accessories to work in different situations including the bathroom, toilet, and kitchen. The main downside of this item is that it doesn’t work very effectively in demanding situations. This is due to the light stainless steel and plastic materials. 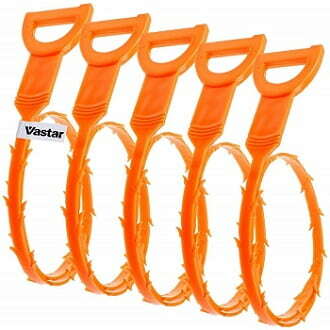 The Vastar Drain Snake aims at unclogging the drains in the bathroom, kitchen, showers, bathtubs and other situations. It is made of plastic which gives it its lightweight and also improves flexibility. The word is that inserting and removing it from the drains is easier than most of its rivals. The head scraps and bores through the blocking material at the turn of the handle with push the auger deeper into the drain plumbing. 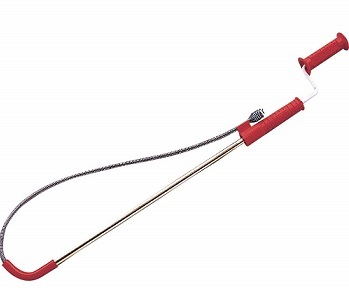 For easy grabbing of the food particles, fur, garbage and other things, the wand features barbs. The handle doesn’t slip when wet and this should improve performance in a wet situation. The main negative of this clogging tool is that it has a tendency to get stuck when pushed too far. You will, therefore, need to exert a little more effort to pull it out. The plastic-made Green Gobbler tool will gobble up any garbage and debris that is blocking your drain. It has a simple design, and most users should find using it convenient. The tool can extend up to 22 inches and together with the moderately slim head will go through most plumbing. It comes in a 5-pack to suit it for different circumstances at home, office, business enterprise and more. It’s made of plastic that doesn’t rust or corrode. It protects the plumbing from scratches, dents or chaffing due to the smooth design. The drain unblocker is made of environmentally-safe plastic. This should safeguard your health and the environment. It is fit for sinks, bathtubs, showers and more. However, it would prefer if the instructions were clearer. The FlexiSnake Millipede clog tool claims to be among the cheapest yet effective snake drains on the market. It features a patented hook and loop technology to grab any clogging material including hair, fur, garbage, and food particles with ease. It requires minimal effort and is among the most has free clog tools on the market. The item can achieve a maximum length of 18 inches for most everyday clogging. 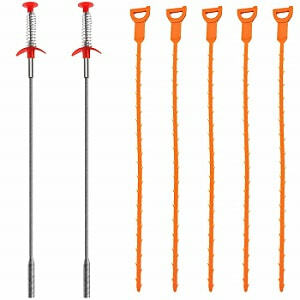 It features 4000 plus micro-hooks and loops for grabbing anything inside the plumbing without undermining the interior surface and construction integrity. The unit is compatible with most bathroom and kitchen drains and doesn’t require disassembly of the stopper. It doesn’t rust or corrode since it’s made of plastic and requires little effort, some soap, and clean water to clean it. On the downside, the clog remover isn’t very long, and this may complicate removal of debris that is stuck too deep. This drain snake is perfect for all types of blocks. It comes packed with 7 clog remover tools including a sinking dredge and one for hair removal. The drain snake is easy to use and is 100% safe for the environment. It will help you avoid the alternative, more expensive chemical drain cleaners. 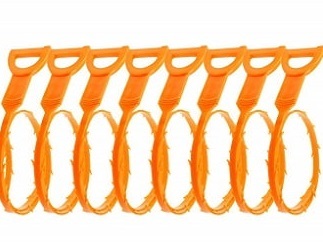 The drain snake is also made from heavy-duty plastic construction. This ensures maximum durability as the device has superior flexibility and can bend around tight angles without breaking. You will, as well, enjoy the long reach feature as the snake drain snake has a reach exceeding 23.6 inches. This drain snake would be the perfect superhero whenever you suffer a clogged shower or kitchen drain. It can come to your rescue instantly and quickly remove any blockages. It will help you remove food particles, hair, and other obstacles and have water draining right again. It is soft enough to move around the multiple bends normally found in shower and kitchen sinks without breaking. 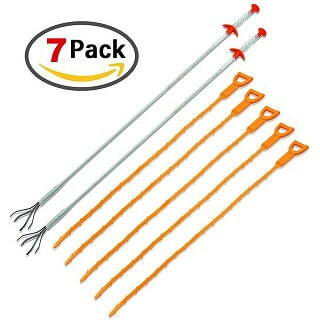 The drain snake, also, comes with 5 options each specializing in the removal of a particular obstruction including; food, garbage, and hair. It also extends 19.6 inches meaning it can reach the furthest corner of your drains and remove dirt found there. It is a great toilet tool that will, also, keep your plumber away. At the same time, it will help you forego the harmful option that is toxic chemical drain cleaners. Have you ever tried scrubbing your drains with a repurposed toothbrush? It did not get you far did it? Well, sweat no more for with the CandyHome drain snake you will have a superior, more flexible alternative. This drain snake is designed to unclog your drains easily. The built-in burrs easily grab food, garbage, and hair effortlessly to clear your plumbing of any obstructions. The CandyHome tool, also, makes it to our list of best drain snake for home use products. 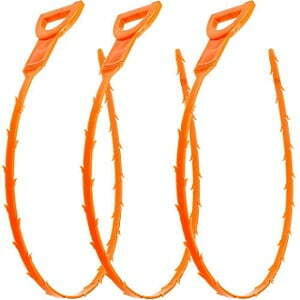 It is super flexible and can withstand multiple bends without breaking. Think of the multiple bends you sinks have; this would be perfect right? This spin-thru drain snake might be the ultimate tool you will ever need. It’s easy highly versatile and easy to use. The drain snake comes with options for different-sized drains including 1 1/4 to 2-inch drains. It, also, comes with the invaluable drive knob and T-grip handle for easy functionality. The Spin-Thru drain Auger has superior reachability too. With the ¼ inch screw being able to reach 25 feet, you can reach even the most inaccessible ends of your drains. The drain snake is, also, economical and will help you save on your expenses down the line. As it is hand-driven, you will not suffer any costs to run it. Additionally, your plumber hiring costs will reduce drastically. 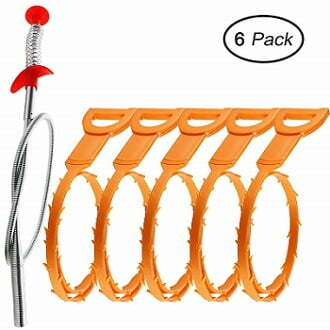 With this drain snake, you will find 7 clog remover options and it has 5 plastic drains and 2 stainless steel. It can be used in a variety of sinks and drains including sewers, sinks, tubs and other areas that are easily clogged. 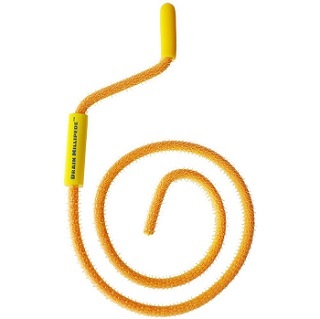 The drain snake will catch hair, food and other food particles lodged in your drains effortlessly. With the snake, you can clear a path for water to pass again. The drain snake, also, has more functionality as it has two cleaning options. With one, you can easily get hold of solid obstacles that fall down your drains. The other tool comes in handy when you need to arrest hair that is causing a blockage down your drain. This drain snake has excellent reach too with 20” of length, you can reach for and get hold of even the hardest to reach corners of your plumbing. Don’t worry either, as it will loop easily and bend with every corner taken by your pipes. 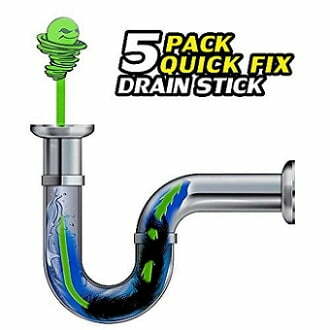 With this drain snake, you will forego the need for environmentally harmful inorganic cleaners. At the same time, you will save on the unnecessary cost of repeat spending on both these cleaners and plumbing services when the blockage persists. Having a drain snake close by can at times save you the expense of calling your plumber to clear a blockage. Such a drain snake comes in handy to remove difficult clogs which might be too much for a regular plunger. Before you rush to make a purchase, though, you need to take into account some considerations. Drain snakes are available in different sizes, brands, and types. Some are power operated while others are hand operated. To break all this down, here are the questions you need to answer before you go about choosing the right drain snake. A hand-driven snake is often sufficient to unblock most drains around the house. The cranking mechanism makes the tool easy to push through pipes. As a result, the snake can effectively clear blockages fast. However, hand-cranked snakes are often shorter and for use on smaller diameter pipes. With power cranked snakes less effort is taken to unclear any drains. You must, however, take extra care while using them as cranking too fast can damage your pipes. Power-driven snakes will handle pipes of any length with ease. For everyday use on sinks, toilets, and drains, smaller drill size snakes would suffice. However, if it’s your main sewer that needs unblocking, then a drain snake with a larger reel would be more suitable. The head on a drain snake plays an integral role in unblocking clogged pipes. As you shop for the nest drain snake, you will find your options having either of the following head options. Screw/Coil Heads – As the name suggests, this head serves to screw itself onto what’s blocking the drains. The head then pulls up the item slowly once it has gained sufficient grip on the obstacle. This head is particularly useful when your soap falls down the drain. With this type of snake drain head, you can easily forego sink soaps until you have found the means to retrieve them. Cutting Head – This snake drain head primarily cuts the blockage into little pieces. These resulting parts are then cleared away by running water through. One must take extra-special care not to cause more damage with the cutting head. Before buying any drain snake too, be advised to confirm the size of your drains. This will ensure you buy only the right drain snake. One that is considered too big for your household could risk doing more harm than good. A clogged pipe might be too much to bear too, should the snake be exceedingly small too. It is true, there is a lot to consider before selecting the best drain snake for your home. Our expert guide provides that comprises the right drain snakes available today. These products are assured to offer you quality and prolonged service. It is true that buying a quality drain snake can save you plenty. You will forego the expensive undertaking of hiring a plumber every time suffer clogged pipes. Such problems will, also, be solved instantly when you have a drain snake on standby. There you go the top drain snakes around. 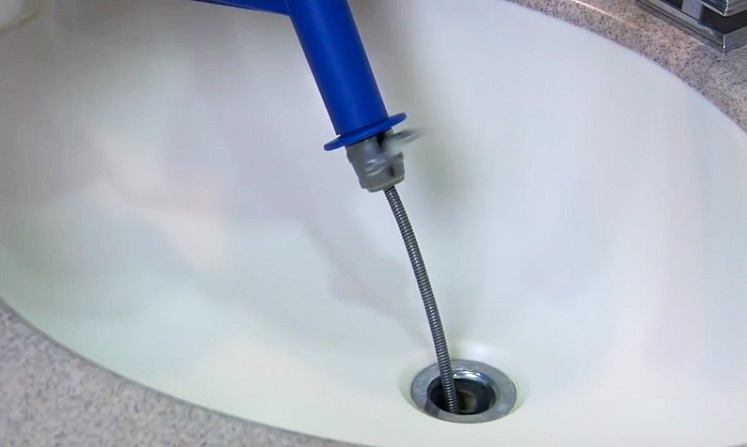 Unclogging the kitchen, bathroom, toilet or any other plumbing point should no longer require too much effort or time. You don’t need to pay always a high price to eliminate the debris blocking the drain. Additionally, you don’t need to anxiously wait for the plumbing expert to come over and have a look at the clogged drain. Such a drain snake is not exceedingly expensive, and with the above options, you will definitely have value for your money. All five have a proven track record of prolonged service with minimum fuss. So, get one today and say goodbye to your plumber. Perfect for those winding drains right? After examination of the market and focusing on the popular choices, we have picked drain snakes that we believe are the best. We paid attention to reliability, effectiveness, ease of use, quality, user-friendliness, safety, and affordability. If you have ever used any of the above pieces or would like to share an opinion, don’t hesitate to leave a comment behind. Our experts are always ready to give you the right answer.